Given just how much we depend on electricity nowadays, it’s normal to look for a quick solution for your home electrical repair needs. As fast as doing it yourself might seem, calling in an electrician will always be the best course of action. Everyone wants to save money, but hiring a professional for home electrical repair isn’t an expense you should try to avoid. Basic knowledge and skills might be enough for various other types of repairs, but when it comes to electrical work, it just isn’t enough. Aside from the obvious dangers involved, you could cause the kind of damage that defeats the purpose of trying to cut costs in the first place. A licensed electrician can diagnose your problem quickly. Beyond that, an experienced professional will resolve your problem in a way that will ensure it doesn’t come back. Unfortunately, even if you or your friends are good with tools, you can’t make that same promise. Trying to fix the problem yourself can make it worse, and when you finally call an expert in the price tag will be much harder to stomach. The job could also become much lengthier, along with additional hours of frustration as the electrician corrects your mistakes in addition to the original problem. When it comes to electrical work, it takes only the smallest error to cause a big issue. Even an incorrectly placed wire could cause extensive — and expensive — damages. These issues could endanger your safety and prolong the duration of the repair job. Experts will also have equipment in their arsenal that allows them to complete the job faster and more effectively than any amateur. As such, trying to save time by attempting repairs yourself is only going to achieve the opposite. Even if you’re skilled enough to address what appears to be the issue plaguing your electrical system, you might still be doing more harm than good. Sometimes performing a minor repair, even one that seems to resolve the problem, only covers up a much more serious underlying issue. This can lead to a much bigger headache down the line, as the hidden problem will only worsen as you mistakenly believe everything is okay. Long-term issues like these become a time-consuming hassle to get repaired. Not only that, but they can also be extremely expensive if allowed to persist for too long. You can avoid all that if a professional handles the home electrical repair in the first place. An expert electrician will catch the warning signs, even the subtle ones, and pinpoint the real issues at work. Sometimes, in spite of how you may feel, a quick fix is actually the last thing you need. Getting the problem repaired the right way so it won’t come back is much more important than reaching a speedy resolution. Also, experienced professionals will not focus only on the home electrical repair that seems necessary. Instead, they assess the full picture when they work, which includes looking into the condition of your entire electrical system. This, apart from allowing for a more thorough and effective repair, can help them identify future problem areas. The earlier a pro spots the issue, the more easily it gets resolved. Hiring an Electrician for Home Repairs Is Much MUCH Safer! Performing your own home electrical repair is an extremely risky move. This isn’t just because of the extra expenses associated with mistakes, or because you’d only make the problem worse. 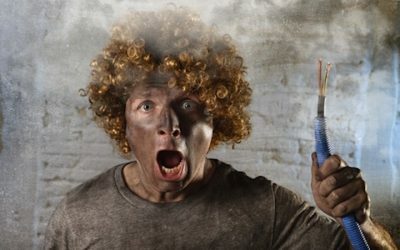 No, the most important reason you shouldn’t try to perform your own electrical repairs is safety! Electrical work can be incredibly dangerous, and many people who try to do their own repairs end up getting themselves hurt — or even killed. Electricity is such a commonplace part of our everyday lives that it can be easy to take its power for granted. Still, it’s important to remember that many have died due to improper handling of electrical wiring and components. Even if you ignore the previous items listed here and hope to save money or time by handling the job yourself, no amount of savings is worth your health or the safety and security of your loved ones. Now that you’ve wisely decided not to risk doing it yourself, the next step is finding a reliable professional to handle the job for you. Whether your needs are home electrical repair or anything else, give our team of experts at Bryan Electric a call at (770) 680-2144 today. We’re more than happy to answer any questions you might have.